Might be the worst sounding record in my collection. Anyone else have a different experience with this MoFi pressing? IMHO one of Benson's best albums, and this Canadian first press sounds really nice to boot. Crisp, clean, immediate sound with great transparency and separation, tight and clear bottom end and excellent instrument definition. CBS Don Mills' mastering engineers really knocked this one out of the park. Don't hesitate to pick up a copy of this pressing if you find one in your travels. Fave track is "Six to Four", the most upbeat track on the album with a killer funky-proggy groove and great solos - I totally forgot how good it was until I rediscovered it by chance on YouTube recently, and that's what motivated me to pull out this virtuosic smooth jazz masterwork for a fresh spin after years. This pressing is amazing! It really lived up to the reputation of Japanese pressings. The mastering is loud, compared to many recent albums and reissues of old albums, yet not compressed until losing dynamic range. The previous owners must have loved it and took good care of it because after 40 YEARS my copy still sounds sooo goood~ Now i feel like buying one more copy to keep! pressed by GZ Media... avoid! luckily i have the Japanese pressed version. Good luck trying to find your version if it's European/German. There must be around 2-3 submissions for every valid release because either people can't be bothered to upload correct, detailed information and pics, or can't be bothered actually looking for their version and so just upload their own. If I had the time I would try and unpick the mess but it would be a full-on solid days work. Some serious merging needed here folks!! Fabulous album, One of the nicest Jazz/Funk LPs about, full of melodic hooks and some truly memorable guitar riffs crossing through into Funk Jazz Soul and some Latin sounding influences. Lovely lush string buildups with chilled production and percussion. For me this is Georges best set, its also his biggest hit for this reason. Also check out Livin inside your love, its sort of like a part two Breezin while not as good its also very similar and a great record. Great to just have a drink to and relax with your loved one. Benson practically invented this style. Details should also note that this issue has palm tree labels as opposed to the white 'lined-paper' style WB labels in the other Canadian entry with the identical catalogue number. One of my favorite jazz albums! My dad got both the LP and CD to this album. It's a pleasant album, but the overuse of strings really dates it. This was around the time when Benson left CTI and joined Warner Bros to make money. Certain tracks here have been overplayed, and because of that I prefer his "In Flight" album for a similar sound that's less well-known. "So This is Love?" is a great track though -- an extended jam with great solos. Not surprisingly, it's the only Benson composition on the album. 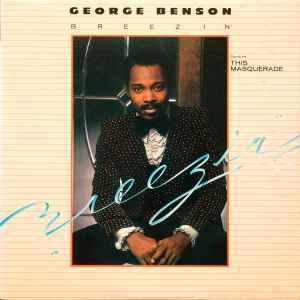 This is one of my favorite George Benson records; Affirmation and Breezin' are some real jams, upbeat with tight bass lines and guitar. Some people like to dog this record because it is smooth jazz but don't pay any mind to that. This album is very easy to find and always very inexpensive; for tunes of this quality it is an excellent value. You must have this if you appreciate the 70s jazz funk sound.